Our article 'Research Articles in Simplified HTML: a Web-first format for HTML-based scholarly articles' was one of the top 5 most viewed #DigitalLibraries and #WorldWideWebWebScience articles published in @thePeerJ journal in 2017! Note that a Preprint of this article also exists, first published October 10, 2016. © 2017 Peroni et al. This paper introduces the Research Articles in Simplified HTML (or RASH), which is a Web-first format for writing HTML-based scholarly papers; it is accompanied by the RASH Framework, a set of tools for interacting with RASH-based articles. The paper also presents an evaluation that involved authors and reviewers of RASH articles submitted to the SAVE-SD 2015 and SAVE-SD 2016 workshops. RASH has been developed aiming to: be easy to learn and use; share scholarly documents (and embedded semantic annotations) through the Web; support its adoption within the existing publishing workflow. The evaluation study confirmed that RASH is ready to be adopted in workshops, conferences, and journals and can be quickly learnt by researchers who are familiar with HTML. The evaluation study also highlighted some issues in the adoption of RASH, and in general of HTML formats, especially by less technically savvy users. Moreover, additional tools are needed, e.g., for enabling additional conversions from/to existing formats such as OpenXML. RASH (and its Framework) is another step towards enabling the definition of formal representations of the meaning of the content of an article, facilitating its automatic discovery, enabling its linking to semantically related articles, providing access to data within the article in actionable form, and allowing integration of data between papers. RASH addresses the intrinsic needs related to the various users of a scholarly article: researchers (focussing on its content), readers (experiencing new ways for browsing it), citizen scientists (reusing available data formally defined within it through semantic annotations), publishers (using the advantages of new technologies as envisioned by the Semantic Publishing movement). RASH helps authors to focus on the organisation of their texts, supports them in the task of semantically enriching the content of articles, and leaves all the issues about validation, visualisation, conversion, and semantic data extraction to the various tools developed within its Framework. In the last months of 2014, several posts within technical mailing lists of the Web (https://lists.w3.org/Archives/Public/public-lod/2014Nov/0003.html) and Semantic Web (https://lists.w3.org/Archives/Public/public-lod/2014Oct/0058.html) community have discussed an evergreen topic in scholarly communication, i.e., how could authors of research papers submit their works in HTML rather than, say, PDF, MS Word or LaTeX. Besides the obvious justification of simplification and unification of data formats for drafting, submission and publication, an additional underlying rationale is that the adoption of HTML would ease the embedding of semantic annotations, thus improving research communications thanks to already existing W3C standards such as RDFa (Sporny, 2015), Turtle (Prud’hommeaux & Carothers, 2014) and JSON-LD (Sporny, Kellogg & Lanthaler, 2014). This opens complex and exciting scenarios that the Semantic Publishing community has promised us in terms of increased discoverability, interactivity, openness and usability of the scientific works (Bourne et al., 2011; Shotton et al., 2009). Nonetheless, HTML is still primarily used as an output format only: the authors write their papers in LaTeX or MS Word and submit sources to the typesetters, who are responsible for producing the final version, that eventually will be published and read on the Web. Appropriate tools in the publishing toolchain are used to convert papers among multiple formats. The interest in Web-first research papers—that are natively designed, stored and transferred in HTML—is increasing. Just to cite a few research efforts: Scholarly HTML (http://scholarlyhtml.org) defines a set of descriptive rules for adopting a defined subset of HTML to describe the metadata and content of scholarly articles; Dokieli (http://dokie.li) is a Web application that allows authors to create HTML-based scholarly articles directly on the browser, adding annotations and many other sophisticated features. This paper introduces a novel approach towards the same goal: providing authors with a subset of HTML for Web-first papers. The format is called RASH, Research Articles in Simplified HTML, and consists of 32 HTML elements only. This format is also accompanied by the RASH Framework, a set of specifications and tools for RASH documents (Peroni, 2017). There are two key differences between RASH and other similar proposals. First of all, RASH adopts a simplified pattern-based data model. The number of markup elements to be used by authors was reduced down to the bare minimum, and the elements themselves were chosen in order to minimize the cognitive effort of authors when writing documents. Secondly, RASH does not come with a full authoring environment but is expected to be produced from MS Word, ODT and LaTeX sources. The basic idea is to allow authors to keep using the word processors on which they routinely write their papers and to provide them with multi-format converters. These converters are included in the RASH Framework, whose architecture is modular and extensible for handling new formats in the future. RASH is in fact intended to help authors in focussing on the organisation of their texts and supports them in the task of semantically enriching the content of articles, delegating all the issues about validation/presentation/conversion of RASH documents to the various tools developed within its Framework. This is a well-known principle in scientific publishing, even if not yet fully applied: clear separation of concerns. The authors should focus on organising the content and structure only, and the format should not require authors to worry about how the content will be presented on screen and in print. The publishers will then take care of creating the final formatting to best render the content in the style of their publications, or authors could use self-publishing platforms as promoted by Linked Research (http://linkedresearch.org). Such a separation of concerns can be pushed much forward. Pettifer et al. (2011) explained well the difference between an article as “an instance of scholarly thought” and “a representation for consumption by human or machine”, and showed how multiple representations can be combined, integrated with external data, enhanced and interacted with in order to provide scholars with sophisticated tools directly within their articles. Another critical requirement for any HTML-based language used for scientific writing is good rendering and acceptance by the publishers. Any new HTML-based format should be beneficial for publishers as well. Of course, publishers, conferences, and workshop organisers, would like to manage new formats in the same way as for the formats they already support, such as LaTeX. To this end, these formats should support tools for their conversion and for rendering the content in specific layouts, such as ACM ICPS (http://www.acm.org/sigs/publications/proceedings-templates) and Springer LNCS (http://www.springer.com/computer/lncs?SGWID=0-164-6-793341-0). RASH adopts a pragmatic approach to this issue: while we are interested in a full-fledged native RASH authoring environment, we implemented a set of converters, in the RASH Framework, that are easily integrable (and were integrated) with existing publishing platforms. if it can be used to add semantic annotations and what are the most widely adopted vocabularies in RASH papers. The rest of the paper is structured as follows. In ‘Related Works’ we introduce some of the most relevant related works in the area, providing a functional comparison of the various works. In ‘Which “Web-first” Format for Research Articles?’ we introduce the rationale for the creation of a new Web-first format for scholarly publications, discussing the importance of minimality. In ‘Writing Scholarly Articles in HTML with RASH’ and ‘The RASH Framework’ we introduce the theoretical background of RASH, and then provide an introduction to the language and the main tools included in its Framework. In ‘RASH and SAVE-SD: an Evaluation’ we present, as a case study, an analysis of the adoption of RASH at the SAVE-SD 2015 (http://cs.unibo.it/save-sd/2015/index.html) and SAVE-SD 2016 (http://cs.unibo.it/save-sd/2016/index.html) workshops. Finally, in ‘Conclusions’ we conclude the paper by sketching out some future developments. The growing interest in the publication of Web-first research papers has resulted in the release of some interesting projects related to RASH. In the following subsections, we discuss all the most important contributions in this area by splitting them into two main categories: (i) HTML-based formats and (ii) WYSIWYG editors for HTML documents. Note that we do not discuss in detail some other efforts that have recently been done by means of non-HTML languages, even if they are equally relevant for the community. ScholarlyMarkdown (http://scholarlymarkdown.com/) (Lin & Beales, 2015), for instance, is a syntax to produce scholarly articles according to a Markdown (http://daringfireball.net/projects/markdown/) input. ShareLaTeX (https://www.sharelatex.com/) is a Web-based real-time collaborative editor for LaTeX documents. In Table 1 we briefly summarise the features and capabilities of the formats presented, in order to highlight the main differences between them. A comparison among existing HTML-oriented formats for scholarly papers according to seven distinct categories. One of the first documented contributions that proposed an HTML-based format for scholarly articles was Scholarly HTML (http://scholarlyhtml.org). It is not defined as a formal grammar, but as a set of descriptive rules which allows one to specify just a reduced amount of HTML tags for describing the metadata and content of a scholarly article. It is the main intermediate format used in ContentMine (http://contentmine.org) for describing the conversion of PDF content into HTML. Along the same lines, PubCSS (https://github.com/thomaspark/pubcss/) is a project which aims at pushing the use of HTML+CSS for writing scholarly articles. It does not define a formal grammar for the HTML element set to use. Rather it provides some HTML templates according to four different CSS styles, which mimic four LaTeX styles for Computer Science articles, i.e., ACM SIG Proceedings, ACM SIGCHI Proceedings, ACM SIGCHI Extended Abstracts, and IEEE Conference Proceedings. HTMLBooks (https://github.com/oreillymedia/HTMLBook/) is an O’Reilly’s specification for creating HTML documents (books, in particular) by using a subset of all the (X)HTML5 elements. This is one of the first public works by a publisher for pushing HTML-like publications, even if the status of its documentation (and, consequently, of its schema) is still “unofficial”. Another project, which shares the same name of one of the previous ones, Scholarly HTML (https://github.com/scienceai/scholarly.vernacular.io), is a work by the science.ai (http://science.ai) company that aims at providing a domain-specific data format based on open standards (among which HTML5) for enabling “the interoperable exchange of scholarly articles in a manner that is compatible with off-the-shelf browsers” (Berjon & Ballesteros, 2015). While the format is not defined by any particular formal grammar, it has a well-described documentation (Berjon & Ballesteros, 2015) that teaches how to produce scholarly documents by using a quite large set of HTML tags, accompanied by schema.org (http://schema.org) annotations for describing specific structural roles of documents as well as basic metadata of the paper. The company also provides services that enable the conversion from Microsoft Word document into ScholarlyHTML format. One of the authors of the previous work is also the chair of a W3C community group called “Scholarly HTML” (https://www.w3.org/community/scholarlyhtml/) which aims at developing a HTML vernacular (https://github.com/w3c/scholarly-html) for the creation of a Web-first format for scholarly articles. It involves several people from all the aforementioned specifications (including RASH), and the group work should result in the release of a community-proposed interchange HTML format. As of September 22, 2017, the online documentation (https://w3c.github.io/scholarly-html/) is mainly a fork of the Scholarly HTML specification proposed by science.ai discussed above. One of the most important and recent proposals, which is compliant with the principles introduced as part of the Linked Research (http://linkedresearch.org) project1, is dokieli (https://dokie.li) (Capadisli et al., 2017). Dokieli is a web application (still under development) that allows the creation of HTML-based scholarly articles directly on the browser, and implements several features among which are annotations (in RDF) and a notification system. The application makes also available some HTML templates and a series of widgets for navigating, visualising (in different formats) and printing research documents easily by using common browsers. Fidus Writer (https://www.fiduswriter.org/) is another Web-based application for creating HTML scholarly documents by means of a wordprocessor-like interface. While the particular format used is not explicitly specified, it allows the conversion of the HTML documents created within the application in two different formats, i.e., EPUB and LaTeX (alongside with HTML). Authorea (https://www.authorea.com) is a Web service that allows users to write papers by means of a clear and effective interface. It enables the inclusion of the main components of scientific papers such as inline elements (emphasis, quotations, etc. ), complex structures (figures, equations, etc. ), and allows the use of Markdown and LaTeX for adding more sophisticated constructs. In addition, Authorea is able to export the document in four different formats (PDF, LaTeX, DOCX, and zipped archive with several HTML files) and according to a large number of stylesheets used in academic venues. Which “Web-first” Format for Research Articles? The term “Web-first” format indicates the possibility of using HTML as a primary format to write, store and transfer research articles, and not only to make these articles available on the Web. Some questions naturally arise in this context: shall we use the full HTML? If we impose a limited subset, which elements should we consider? Shall we demand specific rules for using the language? less focus on the research content—the fact that a certain paper is not visualised in a browser very well (or, worse, in a way that is not the one the author expects) could bring the author to work on the presentation of the text, rather than on focussing on the actual research content of the text. Another point against the use of any HTML syntax for writing papers concerns the possibility of enabling an easy way for sharing the paper with others (e.g., co-authors) who, potentially, may not use HTML in the same way. If all the co-authors of a paper are able to use the full HTML, they may not understand other users’ specific use of some HTML tags —“why did they use the elements section instead of div?”; “what is this freaky use of elements table?”. Hence, the advantages of using a common HTML format is quite evident: only one syntax and only one possible semantics. There is a further issue worth mentioning. Having a shared, unambiguous and simple format would facilitate conversions from/into other complex ones (e.g., ODT (JTC1/SC34 WG 6, 2006), OOXML (JTC1/SC34 WG 4, 2011), DocBook (Walsh, 2009), JATS (National Information Standards Organization, 2012), thus enabling authors to use their own text editors or word-processors to modify the articles. The conversion is instead much more complex, error-prone and imprecise on the full HTML. To complicate an already complex scenario there is the necessary involvement of publishers. Allowing the authors to use their own HTML format could be counterproductive from a publisher’s perspective, in particular when we speak about the possibility of adopting such HTML formats for regular conference/journal camera-ready submissions. From a recent discussion on the Force11 mailing list (https://groups.google.com/forum/#!topic/forcnet/g4BNAOOMjMM), it emerges that publishers are willing to adopt HTML for submissions if and only if it is a clear community need. It means that they will include HTML formats in the publishing workflow only once a number of conference organisers decides to include HTML among the accepted formats for paper submissions2. However, using one clear Web-first format, rather than a plethora of possible variations allowed by the full HTML schema, would certainly lighten the burden of publishers for including HTML within their publishing workflow. This inclusion could be additionally favoured by the availability of services (e.g., editors, converters, enhancers, visualisers) for facilitating the use of such a Web-first format within the existing publishing environments. Last but not least, using a controlled subset of HTML is more appropriate for Semantic Publishing applications (Shotton et al., 2009; Peroni, 2014b). The development of scripts and applications to extract, for instance, RDF statements directly from the markup structure of the text is a sort of nightmare if different authors use HTML in different manners. For instance, what happens when trying to extract the rhetorical organisation of a scientific paper according to the Document Component Ontology (DoCO) (http://purl.org/spar/doco) (Constantin et al., 2016) from two HTML documents that use HTML tags in different ways? Is an HTML element table an actual table (containing tabular data)? Which are the tags identifying sections? These analyses are all easier within a controlled and unambiguous subset of HTML. The subset of HTML we propose in RASH is strictly compliant to a patterns theory we have developed over the past few years. Patterns are widely accepted solutions to handle recurring problems. Firstly introduced for architecture and engineering problems (Alexander, 1979), they have been successfully deployed in computer science and in particular in software engineering (Gamma et al., 1994). In this section, we briefly introduce our patterns for document engineering and then we go into the details of RASH. While we have plenty of tools and languages for creating new markup languages (e.g., RelaxNG (Clark & Makoto, 2001) and XMLSchema Gao, Sperberg-McQueen & Thompson, 2012), these usually do not provide any particular guideline for fostering the development of robust and well-shaped document languages. In order to fill that gap, in the last decade we have experimented with the use of a theory of structural patterns for markup documents (Di Iorio et al., 2014), that has since been applied in several national and international standards, among which OASIS LegalDocumentML (https://www.oasis-open.org/committees/legaldocml/)3, a legal document standard for the specification of parliamentary, legislative and judicial documents, and for their interchange between institutions in different countries. is contained by another element that can or cannot contain text (+T in the first case, −T otherwise). meta [−t−s−T], e.g., the element link. assemblability—each pattern can be used only in some contexts within other patterns. This strictness provides expressiveness and non-ambiguity in the patterns. By limiting the possible choices, patterns prevent the creation of uncontrolled and misleading content structures. Such patterns allow authors to create unambiguous, manageable and well-structured markup languages and, consequently, documents, fostering increased reusability (e.g., inclusion, conversion, etc.) among different languages. Also, thanks to the regularity they provide, it is possible to perform easily complex operations on pattern-based documents even when knowing very little about their vocabulary (automatic visualisation of document, inferences on the document structure, etc.). In this way, designers can implement more reliable and efficient tools, can make a hypothesis regarding the meanings of the document fragments, can identify singularities and can study the global properties of a set of documents, as described in Di Iorio et al. (2012) and Di Iorio et al. (2013). HTML does not use the aforementioned patterns in a systematic way, as it allows the creation of arbitrary and, sometimes, quite ambiguous structures. To apply the structural pattern guidelines for RASH, we restricted HTML by selecting a good subset of elements expressive enough to capture the typical components of a scholarly article while being also well-designed, easy to reuse and robust. The Research Articles in Simplified HTML (RASH) format is a markup language that restricts the use of HTML (http://www.w3.org/TR/html5/) elements to only 32 elements for writing academic research articles. It allows authors to use embedded RDF annotations. In addition, RASH strictly follows the Digital Publishing WAI-ARIA Module 1.0 (Garrish et al., 2016) for expressing structural semantics on various markup elements used. All RASH documents begin as a simple HTML5 document4 (Hickson et al., 2014), by specifying the generic HTML DOCTYPE followed by the document element html with the usual namespace (“http://www.w3.org/1999/xhtml”) and with additional (and mandatory) prefix declarations through the attribute prefix 5. The element html contains the element head for defining metadata of the document according to the DCTERMS (http://dublincore.org/documents/dcmi-terms/) and PRISM (http://www.prismstandard.org/) standards and the element body for including the whole content of the document. The element head of a RASH document must include some information about the paper, i.e., the paper title (element title), at least one author, while other related information (i.e., affiliations, keywords and categories included using the elements meta and link) are optional. The element body mainly contains textual elements (e.g., paragraphs, emphases, links, and quotations) for describing the content of the paper, and other structural elements (e.g., abstract, sections, references, and footnotes) used to organise the paper in appropriate blocks and to present specific complex structures (e.g., figures, formulas, and tables). In the following subsection, we provide a quick discussion about usage patterns in RASH, and introduce the tools used for developing its grammar. 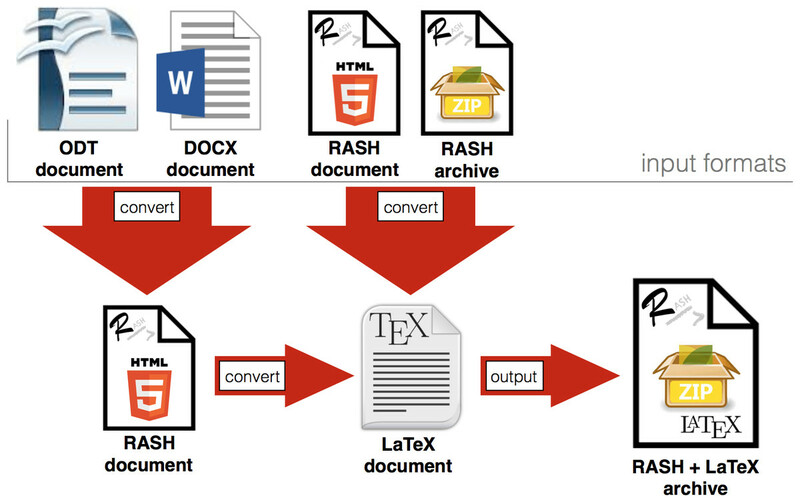 The development of RASH started from the whole HTML5 grammar, and proceeded by removing and restricting the particular use of HTML elements, to make them expressive enough for representing the structures of scholarly papers and to have the language totally compliant with the theory on structural patterns for XML documents (Di Iorio et al., 2014) introduced in ‘Theoretical foundations: structural patterns’. The systematic use of these structural patterns is an added value in all stages of the documents’ lifecycle: they can be guidelines for creating well-engineered documents and vocabularies, rules to extract structural components from legacy documents, indicators to study to what extent documents share design principles and community guidelines. All these characteristics have allowed us to simplify, at least to some extent, the handling of all the requirements introduced in ‘Introduction’ and ‘Which “Web-first” Format for Research Articles?’ in RASH. Table 2 shows what is the current pattern assignment for each element in RASH. The use of structural patterns in RASH. Notice that we do not use two patterns presented in ‘Theoretical foundations: structural patterns’, namely atom and popup. The elements compliant with the former pattern are contained in discursive blocks (e.g., paragraphs) and contain only textual content with no additional elements. This is very infrequent in scholarly writings since any element used for emphases, links, and other in-sentence elements can always contain additional elements (e.g., an emphasis can contain a link). A different discourse can be done for the pattern popup, which is meant to represent complex substructures that interrupt but do not break the main flow of the text, such as footnotes (Di Iorio et al., 2014). An element compliant to the popup pattern, while still not allowing directly text content inside itself, is found in elements with a mixed context [t+s+]. In particular, in developing RASH, we discussed which of the following two possible approaches for defining footnotes was more adequate to our needs. Starting from the latest versions of the language, there has been a clear shift towards an extended use of HTML5 semantic elements, despite the fact they are not backwards compatible with their more generic alternatives in HTML4 (Raggett, Le Hors & Jacobs, 1999). In particular, the elements section, figure, and figcaption have been adopted so as to clearly refer to paper sections and boxes with tables, figures, listings and formulas, accompanied by a particular caption. annotations <a href="#rdfa"></a >  to any  element  of the  document. with the attribute type set to “application/rdf+xml” for adding plain RDF/XML content (Gandon & Schreiber, 2014). It is worth noticing that RASH does not require any particular vocabulary for introducing RDF statements, except three properties from schema.org (http://schema.org) for defining author’s metadata (see the RASH documentation (https://rawgit.com/essepuntato/rash/master/documentation/index.html#metadata) for additional details). For instance, in this document (in particular, in its RASH version (https://w3id.org/people/essepuntato/papers/rash-peerj2016.html)) we mainly use CiTO (Peroni & Shotton, 2012) and other SPAR Ontologies (Peroni, 2014a) for creating citation statements about the paper itself, but alternative and/or complementary vocabularies are freely usable as well. not all the potential authors are able (or willing) to manually add additional semantic annotations, even within the Semantic Web community. The authorial activity of writing an article by using RASH, but also any other new Web-first format, must be supported by appropriate interfaces and tools to reach a broad adoption. A possible solution was to implement a native HTML authoring environment, so that authors did not have to deal directly with the new language. However, this solution would have forced all co-authors to use to the same tool and introduced a variety of technical difficulties, since it is not easy to create and support a user friendly and flexible work environment. We believe that a more liberal approach, that allows each author to keep using her/his preferred tools, even off-line, is more practical. This is the idea behind the RASH Framework (https://github.com/essepuntato/rash) (Peroni, 2017): a set of specifications and writing/conversion/extraction tools for writing articles in RASH. In this section, we give a brief description of all the tools we have developed in the framework. All the software components are distributed under an ISC License (http://opensource.org/licenses/ISC), while the other components are distributed under a Creative Commons Attribution 4.0 International License (http://creativecommons.org/licenses/by/4.0/). A summary of the whole framework is introduced in Fig. 1. The RASH Framework and its main components. RASH has been developed as a RelaxNG grammar (Clark & Makoto, 2001), i.e., a well-known schema language for XML documents. All the markup items it defines are fully compatible with the HTML5 specifications (Hickson et al., 2014). In order to check whether a document is compliant with RASH, we developed a script (https://github.com/essepuntato/rash/blob/master/tools/rash-check.sh) to enable RASH users to check their documents simultaneously both against the specific requirements in the RASH RelaxNG grammar and also against the HTML specification through W3C Nu HTML Checker (http://validator.w3.org/nu/). This will hopefully help RASH users to timely detect and fix any mistakes in their documents. This script also checks datatype microsyntaxes. In addition to the aforementioned script, we developed a Python application (https://github.com/essepuntato/rash/tree/master/tools/rash-validator) that enables one to validate RASH documents against the RASH grammar. This application makes also available a Web interface for visualising all the validation issues retrieved in RASH documents. RASH adopts external libraries, such as Bootstrap (http://getbootstrap.com/) and JQuery (http://jquery.com/), in order to provide the current visualisation and include additional tools for the user. For instance, the footbar with statistics about the paper (i.e., number of words, figures, tables and formulas) and a menu to change the actual layout of the page8, the automatic reordering of footnotes and references, the visualisation of the metadata of the paper, etc. We spent some effort in preparing XSLT 2.0 documents (Kay, 2007) for converting RASH documents into different LaTeX styles, such as ACM ICPS (http://www.acm.org/sigs/publications/proceedings-templates) and Springer LNCS (http://www.springer.com/computer/lncs?SGWID=0-164-6-793341-0), among the others. We believe this is essential to foster the use of RASH within international events and to easily publish RASH documents in the official LaTeX format currently required by the organisation committee of such events. Obviously, the full adoption of RASH or any other Web-first format would make these stylesheets not necessary but, currently, they are fundamental for the adoption of the overall approach. We also developed two XSLT 2.0 documents to perform conversion from Apache OpenOffice documents (https://github.com/essepuntato/rash/blob/master/xslt/from-odt.xsl) and Microsoft Word documents (https://github.com/essepuntato/rash/blob/master/xslt/from-docx.xsl) into RASH documents. The RASH documentation provides a detailed description of how to use Apache OpenOffice (https://rawgit.com/essepuntato/rash/master/documentation/rash-in-odt.odt) and Microsoft Word (https://rawgit.com/essepuntato/rash/master/documentation/rash-in-docx.docx) for writing scientific documents that can be easily converted to the RASH format. The standard features of these two editors (e.g., styles, document properties, etc. ), elements (e.g., lists, pictures, captions, footnotes, hyperlinks, etc.) and facilities (e.g., mathematical editor, cross-reference editor, etc.) can be used to produce fully compliant RASH documents. A web-based service, for converting documents online (presented in ‘ROCS’) and two Java applications for ODT (https://github.com/essepuntato/rash/tree/master/tools/odt2rash) and DOCX (https://github.com/essepuntato/rash/tree/master/tools/docx2rash) documents (that can be downloaded and used offline on the local machine) were developed to facilitate the conversion process of Apache OpenOffice and Microsoft Word documents into the RASH format. In the past few years, as sort of alpha-testing, we have used these conversion approaches with many internal projects in the Digital and Semantic Publishing Laboratory of the Department of Computer Science and Engineering at the University of Bologna. Moreover, also our co-authors and collaborators from different disciplines (e.g., business and management, humanities, medicine, etc.) have successfully used this approach for producing their documents, giving us a chance to have fruitful feedback, comments, and suggestions. In particular, we have been able to convert with discrete success several ODT and DOCX files of research papers, PhD theses, documentations, and project proposals and deliverables. We created an online conversion tool called ROCS (RASH Online Conversion Service) (http://dasplab.cs.unibo.it/rocs) (Di Iorio et al., 2016) for supporting authors in writing RASH documents and preparing submissions that could be easily processed by journals, workshops, and conferences. ROCS integrates the tools introduced in the previous sections. The abstract architecture of the tool is shown in Fig. 2. ROCS allows converting either an ODT document or a DOCX document, written according to specific guidelines, into RASH and, then, into LaTeX according to the following layouts: Springer LNCS, ACM IPCS, ACM Journal Large, PeerJ. Such guidelines, introduced in ‘Producing RASH from ODT and DOCX’, are very simple and use only the basic features available in Apache OpenOffice Writer and in Microsoft Word, without any external tool or plug-in. The main advantage of having the paper both in RASH and in LaTeX is that it is fairly easy for RASH to be adopted by workshops, conferences or journals. Since the program committee, the reviewers, and the editors have also access to a LaTeX or a PDF version of the paper, the RASH file is an addition that does not preclude any current workflows. Of course, the hope is that the inherent advantages of an HTML-based format such as RASH will eventually persuade stakeholders to adopt the HTML version whenever it is possible, keeping the alternatives as fall-back options. section elements are mapped to individuals of the class doco:Section (http://purl.org/spar/doco/Section), which represents a logical division of the text. Sections can be organised according to a variable level of nested sub-sections. Accordingly, SPAR Xtractor reflects this structural behaviour by representing the containment relation by means of the object property po:contains (http://www.essepuntato.it/2008/12/pattern#contains)10. For example, a certain section element with a nested section element produces two individuals of the class doco:Section (e.g., :section_outer a doco:Section and :section_inner a doco:Section) related by the property po:contains (e.g., section_outer po:contains :section_inner). In addition to these semantic annotations, which come from the actual structure of a document, the tool is also able to automatically detect sentences and annotate them as individuals of the class doco:Sentence (http://purl.org/spar/doco/Sentence). A doco:Sentence denotes an expression in natural language forming a single grammatical unit. For the sentence detection task, SPAR Xtractor relies on the sentence detection module of the Apache OpenNLP project (https://opennlp.apache.org/), which provides a machine learning based toolkit for the processing of natural language text. By default, SPAR Xtractor is released to support English only. However, it is possible to extend it with new languages by adding their corresponding models for Apache OpenNLP, most of which are available with an open licence (http://opennlp.sourceforge.net/models-1.5/). We remark that the object property po:contains is used for representing any kind of containment relation among the structural components that SPAR Xtractor deals with. Hence, the usage of such a property is not limited to the individuals of the class doco:Section only. In fact, the property po:contains can be used, for example, for expressing the containment relation between a doco:BodyMatter and a doco:Section or between a doco:Section and a doco:Sentence. For example, let us consider the following code snippets that provide a sample HTML document. The HTML document in the snippet above is enriched by SPAR Xtractor resulting in the document reported in the snippet below. This is  another  sentence  of this  paragraph. RAJE guarantees to its users the benefits of a word processor combined with those given by an HTML-based format, i.e., interactiveness, accessibility and easiness to be processed by machine. In addition, RAJE uses the GitHub API (https://api.github.com/) so as to allow authors to store their articles online, to keep track of changes by means of the GitHub services, and to share the articles with others. The true validation for RASH as a format for research papers rests on its adoption by authors and workshops and its integration in the publishing process. For this reason, RASH was first released in conjunction with the Semantics, Analytics, Visualisation: Enhancing Scholarly Data (SAVE-SD 2015) workshop (http://cs.unibo.it/save-sd/2015/index.html), co-located with WWW 2015. It was subsequently adopted by a number of workshops and conferences (https://github.com/essepuntato/rash/#rash-papers-accepted-in-scholarly-venues). In this section, we will present an evaluation of RASH based on the analysis of questionnaires completed by authors and reviewers of SAVE-SD 2015 and SAVE-SD 2016 (http://cs.unibo.it/save-sd/2016/index.html) workshops and a study on RDF annotations in the relevant papers. The users were asked to fill a questionnaire which included a section about their background, a SUS questionnaire and six open questions about their experience with RASH. We will first introduce the two workshops and then discuss and compare the evaluation results. Finally, we will present an analysis of the most frequent vocabularies and entities in RASH papers. The completed questionnaires and the outcomes of the analysis are available at Osborne & Peroni (2016), while the RDF annotations considered in the study are embedded in the RASH papers available in the SAVE-SD 2015 and SAVE-SD 2016 websites. We used the online version of the RDFa 1.1 Distiller (https://www.w3.org/2012/pyRdfa/) for extracting the RDF annotations from the RASH papers. It is worth noting that in 2015 there were no converters in the RASH framework, and ROCS was introduced immediately before SAVE-SD 2016. Thus, in both years authors wrote RASH papers with plain text editors or XML editors, apart from one author that used ROCS in 2016. In general, the authors appreciated RASH and the tools in the RASH framework, even if the editing environment and the converters are still limited. SAVE-SD 2015 was organized by some of the authors of this paper with the aim of bringing together publishers, companies, and researchers in order to bridge the gap between the theoretical/academic and practical/industrial aspects in regard to scholarly data. It was thus a multifaceted workshop which drew researchers from a number of heterogeneous fields, such as Document and Knowledge Engineering, Semantic Web, Natural Language Processing, Scholarly Communication, Bibliometrics and Human–Computer Interaction. Since many of the interested researchers were keen on experimenting with novel technologies regarding semantic publishing, it was a natural choice for the debut of RASH. For this reason, SAVE-SD 2015 allowed authors to submit papers using either RASH or PDF, explicitly encouraging authors to test the new format. To this end, the organisers introduced a special award for the best submission in RASH, according to the quality of the markup, the number of RDF statements defined in RDFa, and the number of RDF links to LOD datasets. The possibility of submitting in RASH was also advertised on social media (e.g., Twitter (https://twitter.com/savesdworkshop)), Facebook (https://www.facebook.com/savesdworkshop)) and during various international events (e.g., DL 2014 (http://www.city.ac.uk/digital-libraries-2014), EKAW 2014 (http://www.ida.liu.se/conferences/EKAW14/home.html), FORCE 2015 (https://www.force11.org/meetings/force2015)). The initiative had a substantial success: the workshop received six out of 23 submissions in RASH and after the review process an additional author chose to prepare the camera-ready paper in RASH. Out of these seven final submissions, three were research papers, one was a position paper, and three posters/demo. These papers were submitted by 16 authors from Switzerland, Italy, Germany, Netherlands, United Kingdom, Ireland, and the USA. At the time of the workshop submission deadline, there were no public tools available for converting other formats into RASH. However, the authors were able to self-learn it by simply referring to the documentation page, confirming that computer scientists have no particular problem in handling it directly. The conversion of the RASH submissions into the ACM format requested by the Sheridan publisher (responsible for the publications of all WWW proceedings) was handled by the organisers through a semi-automatic process. In particular, they used the XSLT files introduced in ‘Converting RASH into LaTeX styles’ and had to fix only a few layout misalignments. Six authors and four reviewers involved in SAVE-SD 2015 participated in our evaluation. SAVE-SD 2016 had the same characteristics and goals of the predecessor. In order to give authors full freedom, the organizer decided to accept not only RASH, but any kind of HTML-based format. Since it was not possible to handle the conversion of all possible HTML-based format to the publisher layout, the authors of alternative formats were asked to prepare a PDF of the camera-ready version according to the publisher needs. SAVE-SD 2016 received 6 out of 16 submissions in RASH from 14 authors from Italy, Sweden, Greece, Germany, Belgium, and the USA. In total, five out of the 14 accepted papers were in RASH, including two full papers, two demos, and one position paper. Even if no author chose to submit in other HTML-based formats, this possibility will be kept open in future editions. Differently from the previous edition, the proceedings were published as a dedicated LNCS volume. The conversions of RASH papers to the PDF documents in Springer LNCS layout was automatically handled by ROCS. As in the previous workshop, we evaluated RASH by conducting the same study (with the same exact questions) on ten people. Seven authors of RASH papers and three reviewers participated in the survey. It is useful to first assess the background of RASH pioneer users in term of their knowledge of relevant technologies and software. For this reason, the first section of the survey included a number of statements about the user expertize (e.g., “I have extensive experience in writing academic papers with LaTeX”) and allowed five response options, from “Strongly Agree” to “Strongly Disagree”. Table 3 shows the percentage of users who claimed to be familiar with a range of technologies (by selecting “Agree” or “Strongly Agree”). User background for SAVE-SD 2015, SAVE-SD 2016. In 2015, the authors were mainly from the Semantic Web community and therefore familiar with technologies such as RDFa and Turtle. Most of them knew how to correctly annotate an HTML file and understood the advantages of including semantic relationships in the paper. They also commonly used LaTeX rather than Microsoft Word or OpenOffice Writer. This suggests that they were acquainted with WYSIWYG editors and had experience with complex formats. A qualitative analysis of the survey answers confirms this intuition; for example, an author remarked: “I am used to writing papers in LaTeX so I do not want to bother with formatting and in that sense RASH is similar”. In 2016 the situation changed and only 57% of the users were familiar with semantic technologies. In addition, even if most of them knew how to use LaTex, the majority of them had experience also with Microsoft Word. It seems thus that RASH started to interest also less technical users with different research backgrounds. We assessed the strengths and weaknesses of RASH by means of six open questions. We summarize here the answers of both authors and reviewers for the 2015 and 2016 workshops. The reviewers answered only questions 2, 3, 4 and 5. Note that the questions were exactly the same in both editions and none of the users partecipated in both the surveys. [Q1] Why did you choose the RASH format for your paper? Four authors answered that the main reason was to try it out, mostly because they “supported the idea of publishing academic papers as HTML” and were convinced that “PDF should be replaced”. Two of them added that they were motivated by the possibility of adding semantic annotations to their papers. [Q2] How effectively did RASH support you in writing/reviewing the paper? The majority of the authors suggested that some tasks, such as setting up the bibliography, were still cumbersome. They added that the development of tools that could solve these issues and hide the technical details from the common users would be very important for a broader adoption. The reviewers remarked that their experience was very similar to reviewing a paper in PDF format and did not present any particular challenge (e.g., “did not have many features that would distinguish it from a PDF”, “it met all of my needs and was easy to use”). [Q3] What were the most useful features of RASH to help you writing/reviewing the paper? The authors listed a number of functionalities including the multiple graphical layouts (two authors), the support of RDFa annotations (two) and the built-in validation (one). The ability to display the paper according to different layouts was praised also by reviewers. [Q4] What were the main weaknesses that RASH exhibited in supporting the writing/reviewing of the paper? Most authors suggested that the handling of bibliography, figures and captions should be improved. Half of them also pointed out that the manual insertion of semantic annotations was cumbersome and a large amount of RDFa “introduces a bit of confusion in the paper”. An author observed that using the word count as a limit in the RASH venues rather than the number of pages introduces the issue of possibly exceeding the editor limits. Most reviewers did not report any problem in using RASH for assessing a paper. However, one of them noted that it still lacked a menu for easily navigating the different sections, as PDF files instead support. [Q5] Can you think of any additional features to be included in RASH that would have helped you to write/review the paper? The majority of authors suggested that the aforementioned limitations were mainly due to the use of an HTML editor, requesting the development of a WYSIWYG editor or a tool for converting from ODT to RASH. A user also suggested developing a tool for graphically showing the semantic annotations, as “what is linked to what, in order to check the correctness of assertions” and a reviewer advised to implement a way to easily access the different sections of the document. [Q6] Would you use RASH regularly for writing your academic papers? Five out of six authors answered they would like to keep using RASH. Most of them, however, added that this would also depend on the creation of a better editor and a solid array of tools for managing technical details and converting standard formats for writing a research paper to and from RASH. [Q1] Why did you choose the RASH format for your paper? As with the 2015 results, the majority of the authors (four) claimed that they adopted it for trying a new format, three authors because they were motivated by the workshop and three because they actively support the ideas behind RASH. [Q2] How effectively did RASH support you in writing/reviewing the paper? Five users wrote the papers directly in RASH and only one used Open Office and then converted it with ROCS. In the first group, one user was positive, one neutral, and three suggested the need for a WYSIWYG editor, since “writing in html is not so effective” and “not everyone [of the co-authors] knew how to validate against the schema”. In particular, it was suggested the need for a Microsoft Word converter, since the ODT produced by Microsoft Word could not be processed by ROCS. As in 2015, the reviewers did not find many differences with respect to PDF papers. One of them claimed to actually prefer RASH since it “makes better use of the page space”. [Q3] What were the most useful features of RASH to help you writing/reviewing the paper? The authors mentioned a variety of different features including the formatting semantics (“no worries about section and layout”), the bibliographic reference management and the ability to display the paper according to different layouts. A reviewer also praised the ability to convert RASH to PDF. [Q4] What were the main weaknesses that RASH exhibited in supporting the writing/reviewing of the paper? Differently from 2015, the authors had no particular problem with the handling of bibliography, figures, and captions. However, most of them (five) remarked that directly writing the HTML code was not trivial. Three of them suggested solving the problem by introducing a WYSIWYG editor, while two of them suggested creating new converters to translate LaTeX and Microsoft Word into RASH. One user also flagged that the visualization of RASH document can change in different browsers. The reviewers, as in 2015, did not report any particular problem in using RASH. [Q5] Can you think of any additional features to be included in RASH that would have helped you to write/review the paper? Consistently with the aforementioned weaknesses and the 2015 results the users called for the creation of a WYSIWYG editor (3) and a way to convert from LaTeX and Microsoft Words (3). In addition, a user suggested a tool for automatically generating a bibliography, similar to BibTeX. [Q6] Would you use RASH regularly for writing your academic papers? Three authors asserted that they would be happy to keep using RASH, two of them that they were ready to use it again, depending on its development, and only one was negative about it. We also performed a quantitative analysis of the usability of RASH, using the System Usability Scale (SUS) questionnaire (Brooke, 1996). The scores are acceptable, though not very high, especially if we consider that all authors but one edited RASH files directly with text/XML editors. Users perceived even a ‘vanilla RASH’ as acceptable, though they need more sophisticated converters as remarked in the open questions of the survey. RASH yielded a mean score of 62.7 ± 11.9, slightly lower than the average SUS score (68). However, SUS scores varied dramatically according to the person’s background. 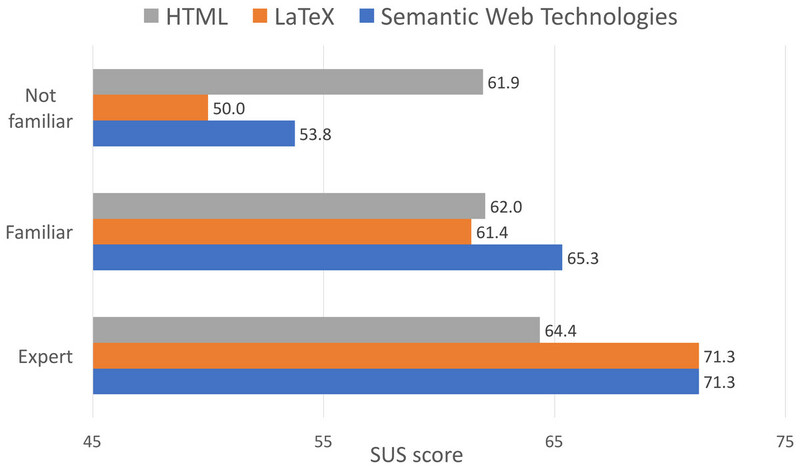 Figure 3 shows the results of different categories of expertize11 in HTML, LateX, and Semantic Web Technologies (SWT), which appear correlated with the average SUS scores (respectively r = 0.78, 0.97, 0.99). Users with a strong expertize in LaTeX and SWT yielded significantly better SUS scores than the other authors, while authors with HTML expertize yielded only slightly better scores. For this reason, authors from 2015, who as previously discussed had a higher expertize in these categories obtained an average SUS score of 69.6 ± 11.9, while the authors from 2016 yielded 57.1 ± 9.7. However, the difference is not statistically significant because the two samples are small and the test power is low. Figure 3: Expertize vs. perceived usability. User expertize in HTML, LaTeX and Semantic Web Technologies versus average SUS score. These results further confirm that most users with limited expertize in non-WYSIWYG editors and semantic technologies find it unfeasible to write HTML directly, even in a simplified form. To complete the previous analysis, we also studied the nature of the semantic annotations in RASH papers. We focused on a sample of 1,751 annotations obtained from 11 papers published in SAVE-SD 2015 and 2016. The number of statements in a single paper was found to range from 24 to 903, yielding a median value of 46 (25th percentile 34, 75th percentile 175). We extracted all the RDF statements by running the W3C RDFa 1.1 Distiller service (https://www.w3.org/2012/pyRdfa/) on each article. We then considered only the statements that used http-based entities as predicates, or their objects if used for typing resources. The data are organised in several CSV files and have been obtained by running a Python script we developed for gathering the data used in this evaluation. The script and all the aforementioned data have been made available at Osborne & Peroni (2016). The first goal of the study was to determine the prevalent vocabularies and how much they were used in the average paper. The left panel of Fig. 4A shows the common vocabularies. Schema.org and PRISM are actually enforced by RASH: the first is used for standard metadata such as emails, affiliations and organization names and the second for keywords. In addition, a quantity of RDF statements was automatically extracted when processing DPUB-ARIA roles (Garrish et al., 2016). Thus we will not consider such vocabularies in the rest of the evaluation. The other common vocabularies are Dublin Core, which appears in 82% of the papers, FOAF (27%) and the SPAR ontologies (Peroni, 2014a), such as FABIO (36%) and CITO (27%) (Peroni & Shotton, 2012). The right panel of Fig. 4B illustrates the average number of statement for each of these vocabularies. Dublin Core characterizes the highest number of annotation (9.4), followed by FOAF (7.4) and FABIO (6.4). Figure 4: Average number of statements per vocabulary. Percentage of papers and average number of statements using a vocabulary. We also performed a more fine-grained analysis considering the amount of entities of these vocabularies within the various RDF statements. The goal was to understand the percentage of contribution that the various entities provide (on average) to the statements of the document analysed. As expected, the entities that contribute to about 60% of the statements are either those that are obliged by RASH (prism:keyword 6.9%, schema:affiliation 5.7%, schema:name 5.3%, and schema:email 4.7%) or those automatically extracted by processing the DPUB roles included, mandatorily, in the documents (xhtml:role 38%). Excluding these, the following top ten entities, shown in Fig. 5, cover about 20% of the statements. Figure 5: Average number of entities per vocabulary. Average percentage of vocabulary entities in a RASH paper (excluding the mandatory ones). Among these entities, there are three classes describing three diverse but interlinked kinds of objects, i.e., people (foaf:Person) authoring a research work (fabio:ResearchPaper) and the sentences (doco:Sentence) therein contained. The other seven entities are three object properties—two of them (pav:authoredBy and pattern:contains) provide the links between the three aforementioned classes, while the other, i.e., cito:cites, describes citation links between papers—and four data properties—used for providing additional metadata about the entities (dcterms:title, dcterms:bibliographicCitation, foaf:name) and for describing bunches of textual content of the sentences (c4o:hasContent). The evaluation study confirmed that RASH is ready to be adopted in workshops, conferences, and journals and can be quickly learnt by researchers who are already familiar with HTML. However, it also highlighted some issues in the adoption of HTML formats, especially by less technically savvy users. Interestingly, the 2016 survey showed that RASH is being tried also by users unfamiliar with semantic web technology. While the expansion of the user base represents a positive development, it also yields a number of challenges. The mass of authors accustomed to WYSIWYG editors such as Microsoft Word or OpenOffice Writer, tend to have difficulties with HTML editors. In addition, since research papers are often written by multiple authors, it is usually simpler to use the most well-known solutions. For these reasons, we need to offer the authors who currently cannot or do not want to change their workflow the tools for converting their favourite format in to RASH and annotate the resulting paper. While ODT was a first step in this direction, it is imperative to be also able to process DOCX (which has been already implemented) and LaTeX. A second important issue is that authors who are not expert in semantic technologies can find it hard to correctly annotate their papers. Hence, we also need to use and/or develop simple tools for helping authors in this phase—such as the OpenLink Structured Data Editor (http://osde.openlinksw.com/). The introduction of these solutions will be critical for motivating users to adopt HTML-based approaches and for creating a robust framework that can be used by expert and common users alike. As far as the analysis of the RDF annotations in RASH documents is concerned, the outcomes highlighted that the users decided to adopt a few well-known standard vocabularies, rather than using a multiplicity of different solutions. The most used vocabularies other than Schema.org and PRISM (used by default by RASH), are Dublin Core, FOAF, and the SPAR ontologies. However, the outcomes of our evaluation generally show a quite low number of statements specified by the authors. This behaviour could derive from the lack of appropriate support for the annotation of RASH papers with RDF data. In addition, this low number seems not to be related to the research community the authors work in. For instance, several of the papers written by Semantic Web experts do not include any RDF statements other than those enforced by RASH. In this paper we have introduced RASH, a markup language defined as a subset of HTML for writing scientific articles, and the RASH Framework, a set of specifications and tools for writing articles in RASH. In particular, we have discussed the rationale behind the development of RASH, and we have presented the language and the validation/visualisation/conversion/extraction/editing tools developed so far. The goal of the paper was also to investigate the applicability and the potentialities of RASH, though the evaluation of its adoption in two SAVE-SD workshops. To the best of our knowledge, this is the first empirical evaluation on the adoption of HTML-based languages for writing scientific papers. The experiments proved that RASH can be successfully used for workshops and conferences, with a good acceptance by the authors and a smooth integration in the existing publishing process. As immediate future developments, we plan to develop tools for automating the process of semantic enrichment of RASH documents. For instance, we are currently working on the automatic identification of section rhetorics and citation functions so as to describe them according to two SPAR Ontologies (Peroni, 2014a), i.e., the Document Component Ontology (DoCO) (http://purl.org/spar/doco) and the Citation Typing Ontology (CiTO) (http://purl.org/spar/cito) respectively. We intend to further develop the RASH framework. In first instance, we are working on more sophisticated authoring tools and converters. For instance, we are currently developing additional XSLT documents in order to convert RASH documents into several different LaTeX formats for scholarly communications—such as IEEE conference proceedings and IOS Press—as well as into EPUB for easing its (offline) portability in mobile devices, which is something that would guarantee a better archival and accessibility of the whole document including its figures, CSS files, and JS scripts. We are also experimenting techniques for automatically generating accessible graphs from data contained in a referenced CSV file. Some results of this experimentation are already discussed in Di Mirri et al. (2017). This archive contains the full source of the article, which has been written in HTML (i.e., RASH, https://github.com/essepuntato/rash). The archive contains also high-resolution images and all the tables are freely accessible and parsable within the HTML source (see elements “figure” containing an element “table”). The main aim of the LinkedResearch project is to propose principles for enabling researchers to share and reuse research knowledge by means of existing Web and Semantic Web technologies towards a future world where researchers can publish and consume human-friendly and machine-readable (e.g., by using RDFa (Sporny, 2015)) scholarly documents. Note that accepting HTML as format for submissions in conferences/workshops is a totally different issue, since this choice is normally taken by the organisers. For instance, see the SAVE-SD 2015 call for papers (http://cs.unibo.it/save-sd/2015/submission.html) and the various editions of SePublica (http://ceur-ws.org/Vol-1155/). OASIS LegalDocumentML is the standardisation of AkomaNtoso (http://www.akomantoso.org/), which is a set of simple technology-neutral electronic representations in XML format of parliamentary, legislative and judiciary documents, and has been already adopted by several parliaments in European Union, Africa, and South America. Please refer to the official RASH documentation, available at https://rawgit.com/essepuntato/rash/master/documentation/index.html, for a complete introduction of all the elements and attributes that can be used in RASH documents. The following prefixes are always mandatory in any RASH document: • schema: http://schema.org/ • prism: http://prismstandard.org/namespaces/basic/2.0/. The content model of an element is the particular organisation of its content in terms of text, attributes and elements that it can contain. In the paper, for the sake of clarity, we use the prefix “@” when we name attributes (e.g., the attribute named “role” is introduced as @role), while we just name elements with their name (e.g., section). The layouts currently available are Web-based and Springer’s Lecture Note in Computer Science (http://www.springer.com/computer/lncs?SGWID=0-164-6-793341-0)—the latter is based on the Springer LNCS CSS included in dokieli (http://dokie.li) (Capadisli et al., 2017). The source code and binaries of SPAR Xtractor are available at https://github.com/essepuntato/rash/tree/master/sources/spar-xtractor and https://github.com/essepuntato/rash/tree/master/tools/spar-xtractor, respectively. The prefix po: stands for the namespace http://www.essepuntato.it/2008/12/pattern#. The authors who answered “Strongly Agree” to the background questions where classified as “Experts”, the ones who answered “Agree” as “Familiars”, and all the others as “Not familiar”. We would like to thank Sarven Capadisli (http://csarven.ca/) for our inspiring discussions on the topic, all the authors and the reviewers of the accepted papers of the SAVE-SD 2015 (http://cs.unibo.it/save-sd/2015/accepted-papers.html) and the SAVE-SD 2016 (http://cs.unibo.it/save-sd/2016/accepted-papers.html) workshops for having provided us useful suggestions and insights for improving RASH and the related tools, as well as all the other early adopters of RASH. We would also like to thank the other two organisers of the past two edition of SAVE-SD, i.e., Jun Zhao (https://sites.google.com/site/junzhaohome/) and Alejandra Gonzalez-Beltran (http://www.oerc.ox.ac.uk/people/alejandra) for supporting us in the adoption of RASH as possible HTML submission format. In addition, we are particularly grateful to all the GitHub users that suggested and introduced new features to RASH and developed the tools included in its Framework: Alberto Nicoletti (https://twitter.com/illbexyz), Vincenzo Rubano (https://twitter.com/titengodocchio), Mike Smith (https://sideshowbarker.net/), Gianmarco Spinaci (https://twitter.com/spino9330), Ruben Verborgh (http://ruben.verborgh.org). Silvio Peroni is an Academic Editor for PeerJ Computer Science. Silvio Peroni conceived and designed the experiments, performed the experiments, contributed reagents/materials/analysis tools, wrote the paper, prepared figures and/or tables, performed the computation work. Francesco Osborne conceived and designed the experiments, performed the experiments, analyzed the data, contributed reagents/materials/analysis tools, wrote the paper, prepared figures and/or tables, performed the computation work. Angelo Di Iorio wrote the paper, prepared figures and/or tables, reviewed drafts of the paper. Andrea Giovanni Nuzzolese and Francesco Poggi contributed reagents/materials/analysis tools, wrote the paper, prepared figures and/or tables, performed the computation work. Fabio Vitali and Enrico Motta reviewed drafts of the paper. Osborne, Francesco; Peroni, Silvio (2017): Outcomes of SAVE-SD 2015 and 2016 questionnaires on RASH and analysis of RDF annotations in the RASH papers. figshare. Alexander C. 1979. The timeless way of building. Oxford: Oxford University Press. Berjon R, Ballesteros S. 2015. What is scholarly HTML? Capadisli S, Riedl R, Auer S. 2015. Enabling accessible knowledge. In: Proceedings of the 2015 International conference for e-democracy and open government (CeDEM 2015). Krems. Universität Krems. Di Mirri S, Peroni S, Rubano V, Salomoni P, Vitali F. 2017. Towards accessible graphs in HTML-based scientific articles. In: Proceedings of the 2nd international workshop on accessible devices and services (ADS 2017). IEEE. Gamma E, Helm R, Johnson R, Vlissides J. 1994. Patterns: elements of reusable object-oriented software. New York: Addison-Wesley. Peroni S. 2014b. Semantic web technologies and legal scholarly publishing. In: Law, governance and technology series 15. Cham: Springer.